A new study led by Oxford University Museum of Natural History has revealed that an extinct group of marine reptiles called sauropterygians evolved similar inner ear proportions to those of some modern day aquatic reptiles and mammals. The research is published in Current Biology today. Sauropterygians were swimming reptiles from the 'Age of Dinosaurs' that included some semi-aquatic forms, nearshore swimmers and fully-aquatic 'underwater-flyers'. Their most well-known members are the plesiosaurs, ferocious sea monsters with four flippers, which hunted anything from small fish and squid to large marine reptiles. The inner ear is a structure shared by all vertebrates, containing an important sense organ that helps maintain balance and orientation. Aquatic animals move more naturally in a three-dimensional environment, so have different sensory inputs compared to animals which live on land. The inner ear is therefore very useful for detecting differences in locomotion in extinct animals, especially by comparing with living organisms. 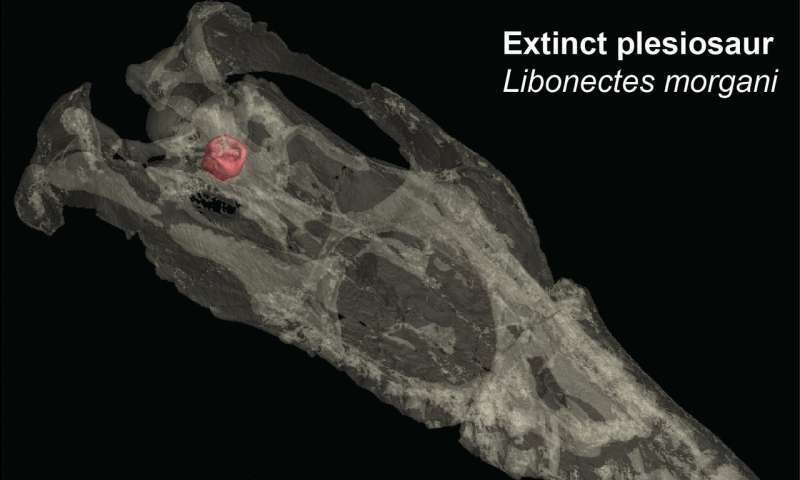 Researchers were surprised when sauropterygians with very different lifestyles had evolved inner ears that were very similar to those of some modern animals. "Sauropterygians are completely extinct and have no living descendants," said Dr James Neenan, lead author of the study. 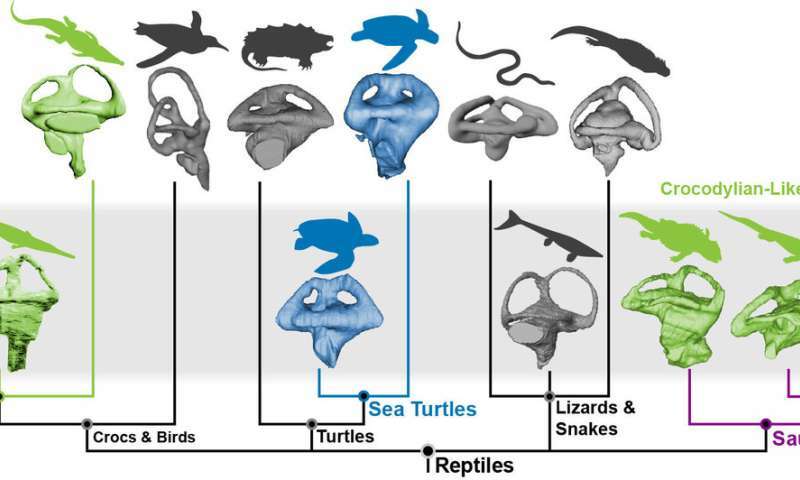 "So I was amazed to see that nearshore species with limbs that resemble those of terrestrial animals had ears similar to crocodylians, and that the fully-aquatic, flippered plesiosaurs had ears similar to sea turtles". The similarities don't end there. Some groups of plesiosaurs, the 'pliosauromorphs', evolved enormous heads and very short necks, a body shape that is shared by modern whales. Whales have the unusual feature of highly miniaturized inner ears (blue whales have a similar-sized inner ear to humans), possibly the result of having such a short neck. Neenan and colleagues have now shown that 'pliosauromorph' plesiosaurs also have a reduced inner ear size, supporting this idea. "Nearshore sauropterygians swam in a similar way and had comparable lifestyles to modern-day crocodiles, so had similar inputs on the inner ear organ," said Dr Neenan. "Plesiosaurs also 'flew' under water with similar flippers to those of sea turtles. So it's not surprising that the organ of balance and orientation evolved to be a similar shape between these unrelated groups".